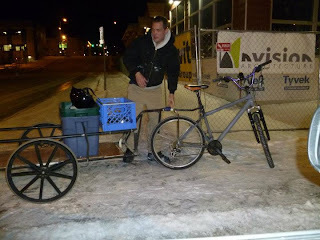 We came across nocturnal solo biker in downtown Anchorage. Where was he going? only he knows, but we past him on our car as we were coming back home. 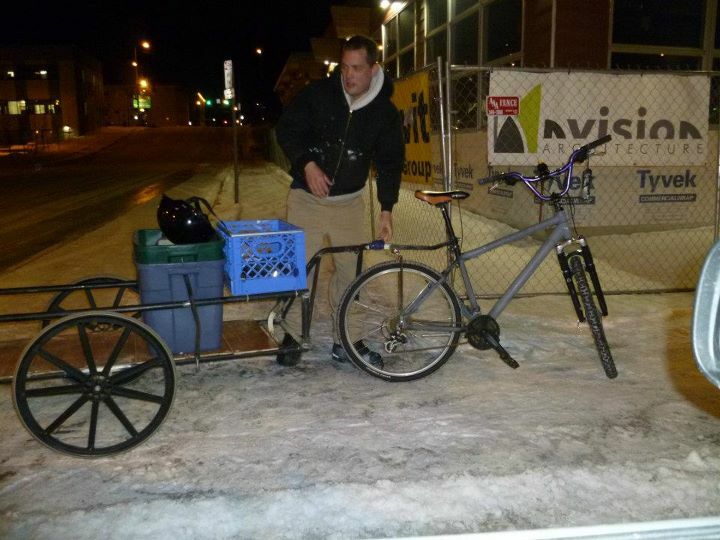 This is the first of the Biking in the Anchorage Winter series, so for now I will share this one picture with you. Notice how this bike has an adapted trailer - quite convenient. I would like to see how it behaves in this type of conditions and with more weight. On the other hand and as you leave the downtown, biking in Anchorage gets reduced to this. This is what a biker in Anchorage during the winter has to deal with. I would say this is more walking than biking. So much for claiming independence from motor vehicles. Not possible in this city as I see it. You can see how the sidewalk has been completely covered by the snow that the Muni machines pick up from the road. I'd say that even if the side walk was clear from snow, the sidewalk is for pedestrians. Bikes have no lane, no sidewalk, no space, no warning signs, no respect and this continues to be the case for more than 50% of the city. As it this was not enough there are those red neck truck owners that throw stuff at you and tell you to get out of the road. Bikers continue to be second class citizens in a city designed and built for the car. There continues to be a complete disconnection between the traffic that bikes reduce and the drivers of motor vehicles in Alaska. Now, this looks dangerous. This particular rider goes against traffic to make sure none of these cars will ram him from behind. Granted this year we broke a record snow fall. I had never seen so much snow fall in Anchorage in one year. It is January 24th and the Muni is just now plowing the sidewalks. I truly admire those that against all odds venture to make the bike their only method of transportation, but frankly, there is a limit and here in Anchorage, riding on the side of the road is very dangerous for many obvious reasons. One of them could be that one of these cars loses control on the snow/ice and you end up being killed. Point in case - bikers will bike if the infrastructure is there; at least men will.